What do golfing, skiing, and incredible panoramic views have in common? Big Bear Mountain! One of two mountains that comprise Big Bear Mountain Resort, it’s a popular year-round destination, much like the city of Big Bear Lake itself. See below to find out some of the activities that Big Bear Mountain hosts, whether it’s summer or winter. And, if you’re looking to discover what else there is to do in Big Bear Lake, download our free Vacation Guide! It’s a great resource and is sure to save you time planning. Big Bear Mountain and it’s twin Snow Summit are probably best known for their skiing and snowboarding opportunities. Considering that the Big Bear Mountain Ski Resort has been around since 1943 when it was known as the Moonridge Ski Area, this is hardly surprising. Whether you have never strapped on a pair of skis or your skills are more advanced, Big Bear has a trail for you, with an even mix of trail difficulties. In addition, Big Bear Mountain is particularly accommodating for beginners, as it features the largest learning area in Southern California. Another unique feature this ski resort sports is adaptive recreation, so adaptive athletes of all ages can ski and snowboard! Its sweeping 8805-foot elevation is also home to Southern California’s only halfpipes, making Big Bear Mountain a ski and snowboard destination. For more general information, including Big Bear Mountain’s weather, ski season dates, and hours of operation, visit Bear Mountain’s website. When the sun shines warmer in the deep blue skies over Big Bear Mountain, you can expect the mountain to transform into a tranquil haven. The verdant greenery of the pine trees paired with distant mountain views makes for stunning beauty. What better way to enjoy it than through the reflective sport of golf? Big Bear Mountain features a par 35 nine-hole golf course nestled amongst alpine trees and mountain peaks. But don’t let the lovely scenery distract you—the rolling hills of this course add challenge to the greens at Bear Mountain Golf Course. For a fun twist, try glow golf! Whether you’re looking to play through the course once, or want to visit multiple times, there is a range of passes available. 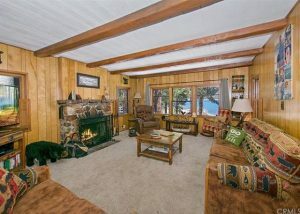 There’s nothing quite like staying in a gorgeous cabin while in the charming, bustling mountain town of Big Bear Lake. There’s a level of comfort and a certain connection to the outdoors that burnished wood floors, log furniture, and crackling fireplaces offer that alternatives just can’t match. When given a choice between a nondescript hotel and a cozy cabin with plenty of personality, its a no-brainer! Our cabins are close to all the top attractions in Big Bear, so whether you want to take a hike, enjoy the shopping and dining at the Village, spend the day lakeside, or at Big Bear Mountain Resort, you’ll be within a short drive. Stay in our cozy Lakeview Shores cabin, and there will be no shortage of things to do! Play a round of pool, try your hand at chess with the unique set, or relax on your deck and enjoy the views of Big Bear Lake. There are three bedrooms, three bathrooms, a large kitchen and plenty of cozy seating areas. And did we mention the incredible views of the lake? Be sure to browse all our accommodations, and book your stay in Big Bear today!